May 2014, approximately three months later. She already has over two inches of new growth! She will be taking it down this month and getting it redone because she is on a quest to grow her hair back long. 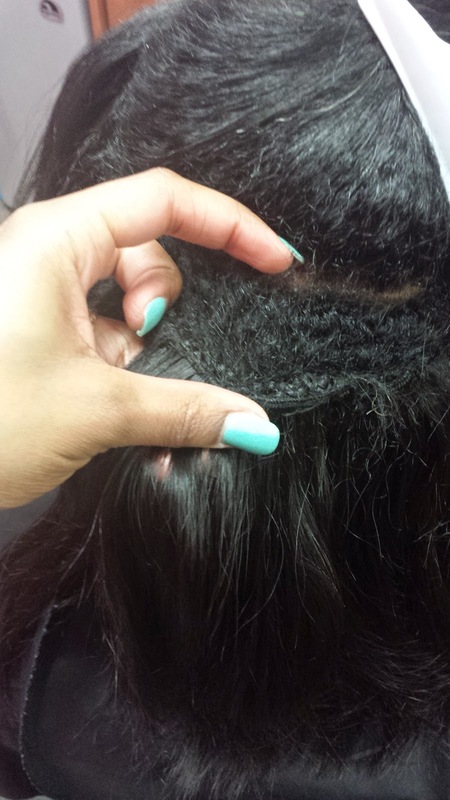 The pictures show how much the braid has grown from the scalp. Remember, that when you get a sew-in the hair is braided to the scalp then the weave is sewn onto the braid. As the hair grows the braids become looser. 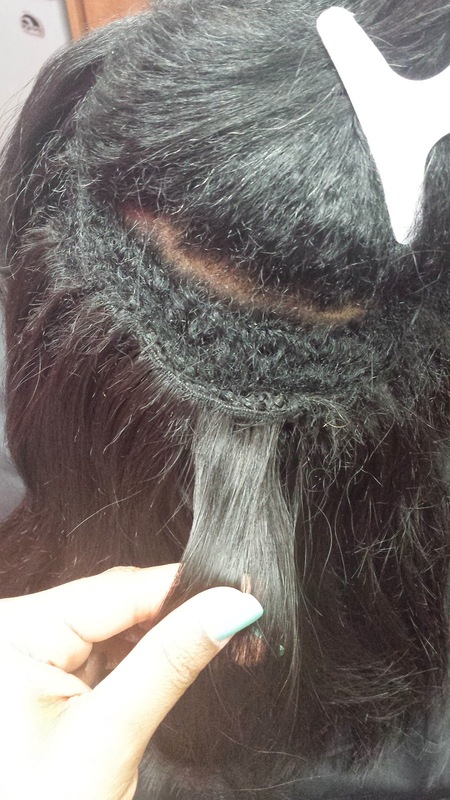 If you look closely at the picture, the weave is still sewn onto the braid, but the new growth has made it become loose. She is very close to having this hair taken down in the very near future. At that point I will shampoo and deep condition her hair very well before doing it all over again. There will be no breakage or damage because her hair was healthy to begin with. Had her hair been damaged before the sew-in, the stress of the braiding and sewing of the other hair would have only made it that much worse. Also the sew in can last much longer than three months but at that point it is time to take it down and give the natural hair some much needed attention. 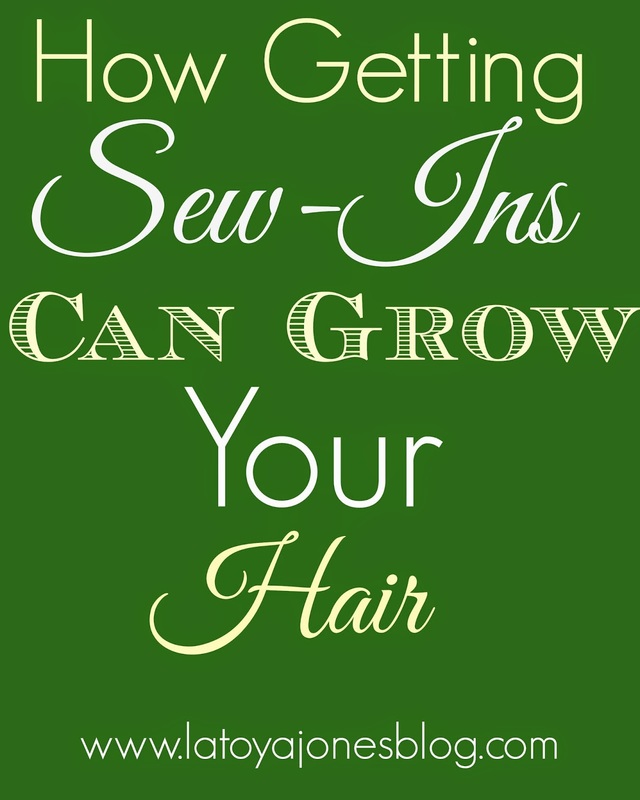 Leaving it in longer than the recommended time can also cause the hair to become matted or even begin to grow mold! This would result in the hair having to be cut which is the exact opposite of the whole reason for getting a sew-in in the first place. Remember, wearing weave should always be an option, not a requirement. Healthy hair first!